We are always told that you can’t have your cake and eat it too. At KEENE, we are continually coming up with ways to change this. In today’s construction trends, we are constantly looking for ways to make our structures more comfortable, more luxurious, more cost effective, and increasing energy efficiency. Radiant heating is a great example of this trend. It is a fantastic and energy efficient way to provide warm comfortable floors, as well as provide heating throughout an entire living space. By circulating warm water throughout a system of tubes that are typically concealed in a layer of gypsum concrete, the radiant tubes provide a warm and easily regulated room temperature with greatly reduced heating costs compared to tradition methods. Sounds good doesn’t it? Well actually it may not. Typically the radiant tubes are stapled down to the subfloor, which would eliminate the effectiveness of any impact noise-reducing mat to help quell the very troublesome footfall noise in multifamily construction. This posed the question of which was more important: energy efficient heating or the peace and quiet of a comfortable living space? To combat this, KEENE has detailed and perfected a method where you won’t have to sacrifice comfort for privacy. KEENE’s Quiet Qurl sound mats are the industry leading method of increasing a floors/ceiling assembly’s ability to limit the amount of impact noise can pass through from the floor to the ceiling below. Quiet Qurl is an entangled net sound mat that limits the amount of connections that the finished floor and the subfloor have in common. Since vibrations travel via connections, this “floating” effect greatly reduces the capability of these vibrations to travel through the floor, thus the living space below experiences much less sound. KEENE’s preferred method of installing radiant heating over Quiet Qurl is to use ties to attach the radiant tubes to a piece of metal lath than can be simply loose laid over it. 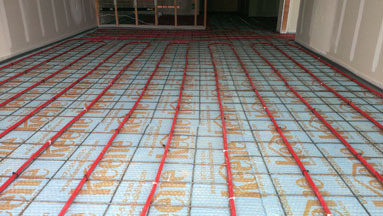 This ensures that the radiant heating contractor can securely lay out all of the radiant tube without the need of hundreds of staples into the subfloor. A simple approach that works while giving the best of both worlds! No longer do we have to decide between these two great building sciences. KEENE and Quiet Qurl helps you have your cake and eat it too!